In 2018 Jaeger-LeCoultre proudly continues its partnership with Casa Fagliano, the celebrated Argentinian bootmakers. To underline the exclusive nature of this collaboration, a Reverso Tribute Duoface is being issued in a limited edition of 100 pieces on a two-tone cordovan leather strap demonstrating an outstanding leathercraft tradition. This exceptional piece will delight all lovers of fine collectibles, and will be sold exclusively in Jaeger-LeCoultre Boutiques. 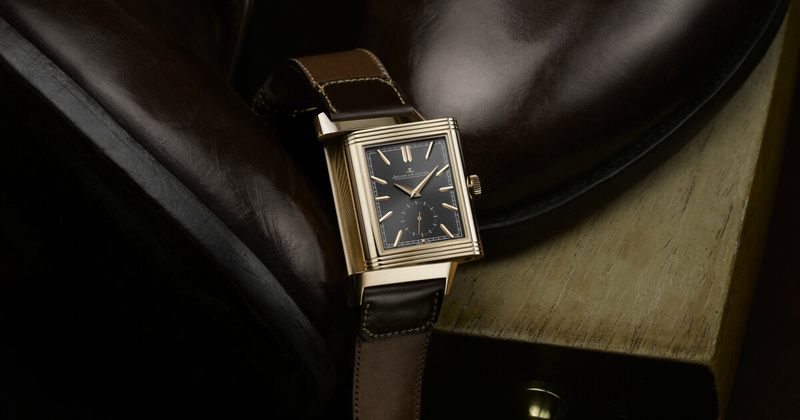 All the skills and expertise of Jaeger-LeCoultre are discernible in the timeless and discreet elegance of the Reverso Tribute Duoface watch in a pink gold case. Driven by the Duoface concept, this watch offers two contrasting dials - both equally refined and each displaying a different time zone. The slate grey sunray dial on the front features hand-applied hour markers that echo its Dauphine hands. A small seconds in a round minute track brings a softening note to the pure geometrical linearity of this watch, whose Art Deco design reflects its 1931 inspiration. On the other side of the watch, the local time is displayed on a silvered dial that creates an elegant play of light through the juxtaposition of two finishes - a Clous de Paris guilloche on the background, and an opaline finish in the centre. The day/night indicator brings out the rounded curves and gives added character to this fascinating watch. A warm-toned pink gold case makes a beautiful match for the Casa Fagliano Edition two-tone cordovan leather strap, specially designed and hand-crafted for each piece by these famous Argentinian leather artisans. When one of Argentina's greatest bootmakers joins forces with the Jaeger-LeCoultre Manufacture, the result is the very pinnacle of craftsmanship. A family business running since 1892, Casa Fagliano works a soft and supple leather known for its great strength, following techniques handed down by long tradition. 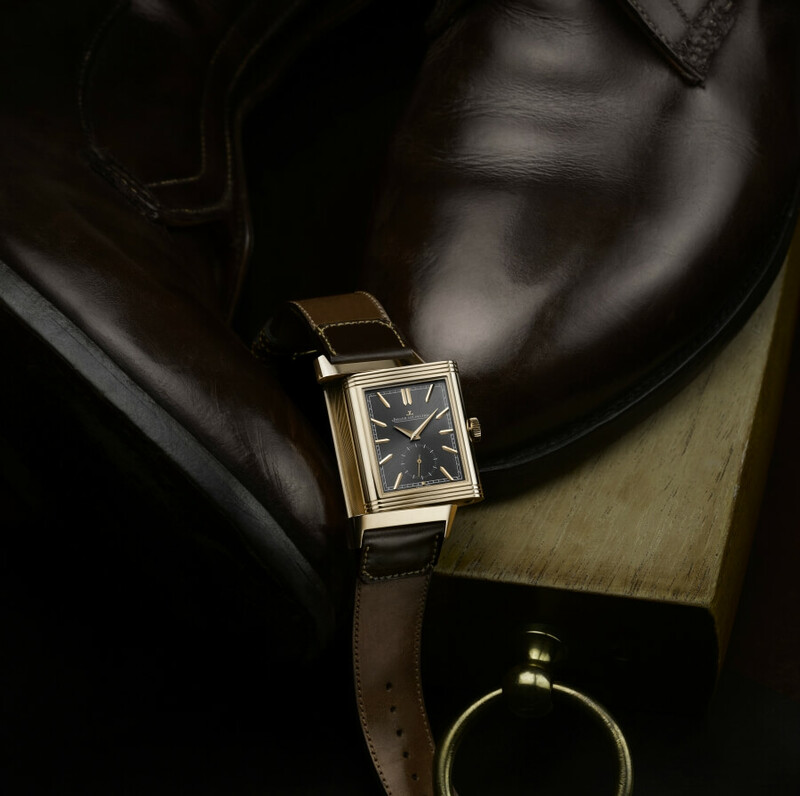 For the Reverso Tribute Duoface, the two-tone strap allies a light brown with a darker brown shade on the turned-over flap, and features a tone-on-tone overstitching on both sides of the dial's gadroons. Each strap is hand-crafted, with its own unique patina and finishes making it a one-off. The words "Limited Edition - One of 100" engraved on its back emphasise the exclusive nature of this watch, which will be available as a limited edition only in Jaeger-LeCoultre Boutiques. Its refinement will not escape those who appreciate craftsmanship at its authentic and original best. The Grande Maison and the renowned bootmakers have a great number of values in common. Their two realms share a respect for expert craftsmanship, meticulous detailing, a passion for the product, and the pursuit of perfection.